The last time I had real pancakes was when I was going to college and drinking a little more than I probably should have been. Pancakes (and bagels) were the perfect hangover cure back then. That was also during a time when I wasn't taking the best care of myself and unfortunately my diabetes took a little back seat. I have decided that just because I can't eat carbs does not mean I need to sacrifice some of my favorite foods. HELLO pancakes and mashed potatoes. These might just change your life...okay maybe not but they have definitely made my Saturday mornings just a little bit more exciting. I used this recipe as a guideline and made a few tiny tweaks along the way. The magic ingredient in these pancakes that makes them virtually carb free is almond meal/flour. * you could also add a dash of vanilla for a little extra sweetness. Measure out 1/4 cup of batter and pour onto a a hot pan will a little butter or oil. Cook them as you would normally cook pancakes. Flip them when you see a few bubbles on the top and the underside is light brown. If you are a carb counter here is a little break down of how "skinny" these really are...Pancake mix or regular flour has about 24 grams of carbs for every 1/4 cup, almond flour has only 3 grams of carbs for every 1/4 cup. That is a HUGE difference. These definitely have the taste of almonds, which I love. They are not as sweet as regular pancakes but you can add blueberries or bananas into the mix to spruce them up a bit! I also recommend topping each pancake with a little butter. I noticed this helps to soften them up and make them taste even more like the real deal. Not only are these delicious but they will not make a dent on your scale! PLEASE leave a comment below if you try these. I would love to know what you think! This looks amazing! I will have to try it! So grateful for your "skinny" posts. My husband is Type 1 and I had gestational diabetes with my second pregnancy, so I'm always on the look out for diabetes-friendly recipes that don't taste like..... well, yucky. 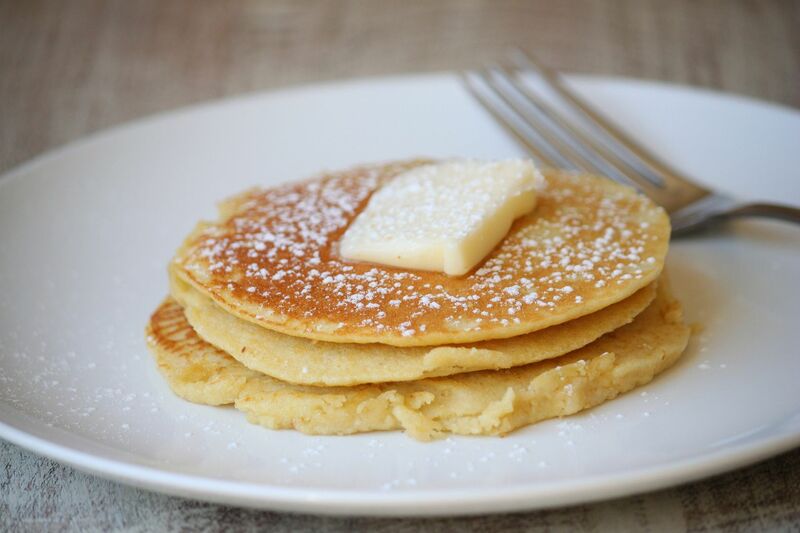 pancakes sound so tasty right now! 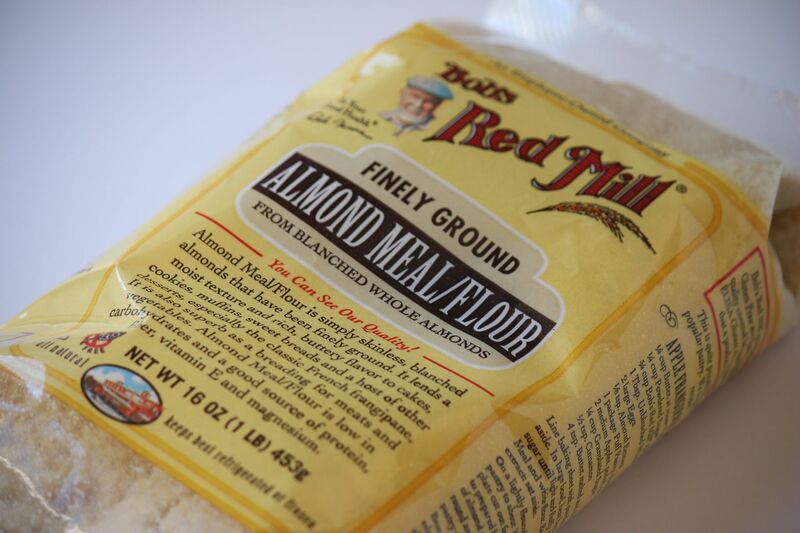 This is such a great idea - I recently discovered almond flour for my low carb lifestyle. I found a recipe online for chicken nuggets, and I'll eventually post it on my blog - but it's just cut up chicken breasts, dipped in beaten egg, dipped in almond flour with some spices, and then baked. It was so good, and I love feeling like I'm not missing out on any foods. These look positively delish! I have never used almond flour - sounds soooo good! Mmmm, I am definitely going to have to try these babies out! I would have to add some Blueberries and Strawberries to it as my tweak! Lauren- They might actually be even better as waffles! Great idea! Another genius post. Thanks! These look so yummy. Awesome recipe! I would love to give it a try! Thanks Linds! Oh I would love to make pancakes tomorrow for breakfast! Those look so yummy! Wow these are definitely a lot skinnier! I love how creative you are when it comes to finding alternatives for the foods you love! What? Wow...and I mean just by looking at them I would have guessed they were the real things. Going to give them a try! I just recently went gluten free (for a second time) and I've been trying to come up with a good pancake recipe. Thanks! I'll try them this weekend and let you know! Great recipe!I love Almond Meal. It can also be used to make French Macarons! YUM! I love eating pancakes as a midnight snack...how terrible is that?! ha ha..I have not done it in so long, but now I am craving them! :) At least these are "skinny!" im a giant pancake girl! this made me soooo hungry! I just discovered your blog and I love all of the tips and healthy recipes!!! I'm a new follower!! I love pancakes on Sunday mornings, my husband and I do it every week! I've tried making them with almond flour but they never turned out quite right, so I'm excited to give these a try! my kiddos are pancake freaks so i will for sure try this! I recently found your blog through Katrina's and I love reading your posts. I'm trying to change my lifestyle to be much healthier and I just love your recipes!! Thanks so much for sharing! Ive never tried almond flour but these sound yummy. Wow! Thanks for sharing! I have to try these! Do you have a calorie count on this? These look delicious! I think coconut oil instead of walnut oil could be amazing! About how many pancakesndoes this recipe make? Just made some almond flour and totally have to try! I'm a low carber and getting bored with my "normal" foods. Thanks for the breakfast idea! :( I just tried these and they were super dense and very mealy. The flavor was amazing though! I wonder what I did wrong. Definitely a different texture... but so yummy! I added almond extract, because I'm an almond freak ;) Maybe butter, instead of the walnut oil next time. Definitely a keeper! So glad I found your site on pinterest. Thanks for all of the great ideas! where can you find almond meal? is it gluten free? I tried it and we just can't get over the texture. The taste was fine, but we felt like we were eating grits. Any suggestions? I can't wait to try these pancakes on my family. My son is Type 1 & my daughter has Celiacs Disease. Tough combination when cooking since most gluten free recipes are loaded with carbs. These are so pretty! And I'm a big fan of almond flour. I just tried them and they are good!! Mine didn't look like yours though. LOL I will be trying these again with some added fruit. Mmmmm Thanks for the recipe!! Added it as "Delighted Momma - Skinny Pancakes (Almond), 1/4 cup"
Tried them, loved them!!! I used honey for sweetener and also put a little honey and butter on the top! Yummy! I would definintely throw some banana or blueberry in the mix next time around. Oooh I haven't made pancakes with almond meal but I do love it as a coating for fried food alternatives. I use it to batter chicken, pickles, zucchini....bake at 400 degrees and it turns out nice and crunchy! Is this recipe simple enough that us carb lovers can substitute regular or whole wheat flour? I tried these and they needed at least 1/2 cup more liquid in order to "pour" like pancake batter. I used unsweetened soy milk instead of water and they were very good. Sometimes I smear a little bit of reduced fat peanut butter on top to jazz them up a bit... Sooooo yummy! Don't miss the real thing at all! Amazingly good! So glad I tried this. I had to improvise a touch, only because I didn't have exact ingredients. Used coconut oil instead and equal...and yet, they were incredible. The coconut oil definitely gave it a good kick. Thanks so much! if you can have dairy, add a cup of low fat/fat free cottage cheese and another egg and they'll be super tender. Super tasty, but really high in fat and calories. It can be an every once in awhile treat, thank you! I used this recipe this morning but put the batter in the waffle iron. Delicious! I'd love to try it next time with milk instead of water, maybe take fro_mommie's suggestion and use vanilla almond milk. I made these this morning. I liked them, but I think if I make them again I will substitute apple juice for the water. That will make a nice apple/cinnamon combo. You really don't need more than a pancake or two to be satisfied. I've never been a pancake fan, however I've recently gone Paleo and decided to give these a whirl since I can no longer have french toast (a favorite). I have made these 3-4 times now and I absolutely love them. I add blueberries to the mix and they are quite delicious! I make them with cheese, no sweetener. I spread home made pesto on top and take them with as part of my lunch! I made these this morning- delicious! I get to enjoy pancakes alongside my kids once again! 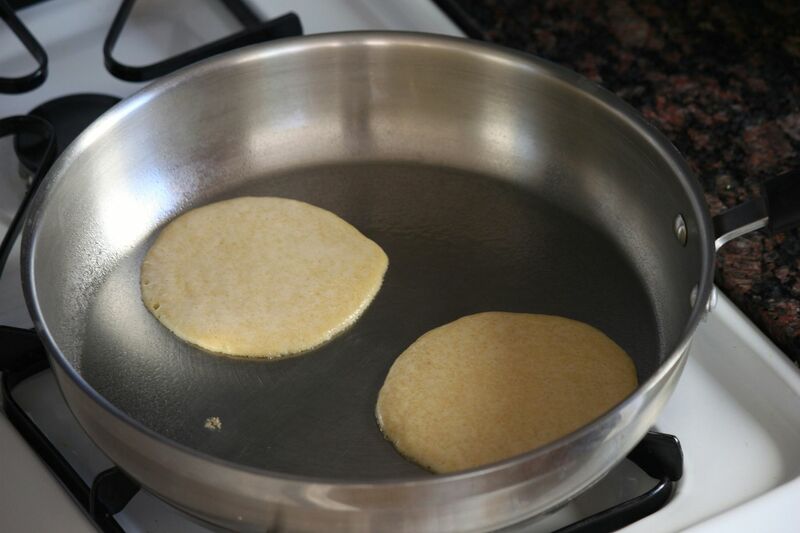 The latter two provide a leavening agent and will help the pancakes rise as they cook. I make a similar "paleo pancake" with almond meal, a mashed banana, a tiny bit of baking powder, and an egg... maybe add a little cinnamon and vanilla if you want. They taste like banana pancakes, or even more like banana bread. Try it out... it's awesome! These are a great foundation for lots of ideas! I am a professional chef and was recently diagnosed with gestational diabetes due to insulin resistance. Being pregnant and on a limited diet means I'm always starving!!! These COMPLETELY curbed that and only raised my sugar 4 points! I added 2 tsp of sour cream to mine and a little baking soda. I also found that the almond "meal" doesn't work as well as the straight almond "flour". After I got the mixture right, they were perfect!!! THANKS SO MUCH!! what is the nutrition value for these? This sounds great regarding carb content but I'm allergic to all nuts. Any substitutes out there that are similar?? Pretty sure 1 tsp of cinnamon would make these inedible - I added 1/4 tsp to mine, and that was plenty! They were OK, you can't go into it thinking they will taste like your usual pancakes. I'll try it the next time with half almond meal and half all-purpose flour, that should be a good balance of tasty, more healthy and easier to flip. I am not a carb counter but I do check the sugar content even if I am not diabetic. I am pregnant right now so I just taking extra precaution. Mixing almonds to pancakes is a great idea! I am not a carb counter because I just focus on the sugar content of the food that I am going to eat. With two T1 sons, one of whom is also coeliac, these pancakes are a hit! Tasty, low carb and low sugar they really hit the spot. The advice of adding sour cream and bicarb works beautifully. Thanks for the inspiration! Made them today, didnt look at all like your pics, and were much heavier than expected. where did i go wrong! I made my own almond meal by grinding natural raw almonds. From reading the comments, I will try almond flour next time as mine were heavy, dark in color, and mealy. I enjoyed the flavor though. Had mine with no sugar added pancake syrup and butter. thanks for the recipe! I don't think supermarkets sell almond flour over here, but it sounds totally delicious and probably low calories! This was great! No, they don't have the exact same texture as finely ground flour, realize that you are using almond meal NOT flour. You can help that a little bit by using a coffee grinder to pulverize the Almond more though. I also used sparkling water instead of regular, added a TB of cream cheese for texture, and a tsp of baking powder for the fluffiness. If you use flavored sparking water (I used blueberry) then top it with something like Walden's cal free/sugar free syrup? It's HEAVEN!! I made them for breakfast this morning and added fresh blueberries and topped with a little whipped cream (no carbs in the whipped cream) and they were delish! I also added 1/4 cup of almond milk to make it a little less dense. Only just found this recipe on Pinterest and tried it immediately .. almond meal (Bob's Red Mill, anyway) doesn't have that soft, fluffy texture of regular flour, so I beat out the lumps a bit (though didn't feel it was necessary to pop it in a food processor for any add'l processing. I used coconut milk instead of water (the milk substitute, not the stuff in the can .. though that might be interesting) and added just a bit more, not quite a 1/2 cup but close. I used a tbls of Xylitol as a sweetener and half of a very ripe banana. The batter was perfect and made six small to medium sized pancakes. I whipped up some coconut cream (the stuff that solidifies on the top of a can of coconut milk) and added it as a topping over the pancakes and fresh strawberries. Great recipe, easy, and easy to change on a whim! Yummy! Made this as a 1/2 recipe with the soda as someone mentioned and even totally forgot the oil! Cooked On griddle with butter and gobbled up with SF syrup! Then used the other 1/2 recipe to make fried cornbread. From the south ya know, lol. Subbed the water for 1/2 water and 1/2 buttermilk, left out the cinnamon and cooked on the griddle with olive oil spray. Sooooo good. Now i can have pancakes AND cornbread!! Happy girl!! These "pancakes" taste HORRIBLE. I'm sorry if this feedback is too honest, but they are gritty, incredibly dense, and honestly hard to swallow. I think this recipe should be removed or significantly altered. Almond flour is expensive, which makes this recipe a double bummer. Thanks - these were great! I made just a tiny batch - 1/4 cup almond meal, 1/4 cup other GF flour, some baking powder, 1/4 tsp salt, 1/8 cup water, splash almond milk and one egg. Loved my breakfast today! Just made these, they were great! Thank you for such a wonderful low carb recipe. Even my 16 year old full carb son loved them! These were really good. Made them in the waffle iron and I cut the recipe in half. So yummy topped with cream cheese and real bacon. Thank you. Mine tasted really good, but were also extremely dense with a mealy texture. And definitely no bubbles to see when they were done, too thick and not fluffy. I would still make them again though. Yum :) I don't have a lot of experience with almond flour. I've only found one kind locally. I wonder if there are some that are ground into much finer powder? Maybe that is the problem? WAAAAYYYY too much almond flour....typo in recipe??? Next time I'll only use a 1/4 cup or so. I made these this morning and would need to agree with those who stated that there needed to be more water added. I used Trader Joe's Just Almond Meal. I added enough water to make the pancakes runny, and the recipe made 5 decent sized pancakes. I made these this morning. Although the texture was different and a little mealy, they still tasted great! It was a perfect change to my daily fried egg breakfast. Thank you for your low carb option. I actually cooked them in my antique 1910 cast iron waffle maker. I was able to get two good size waffles out of the recipe. One is enough for me, so I am hoping that the leftover will reheat well. Oh, and I also added a little bit of sugar free blueberry jelly as a topping (since I cannot have syrup and it needs some kind of sweetner). Yummy! Thanks again! There is Almond meal, which works for these but gives a grainger texture. 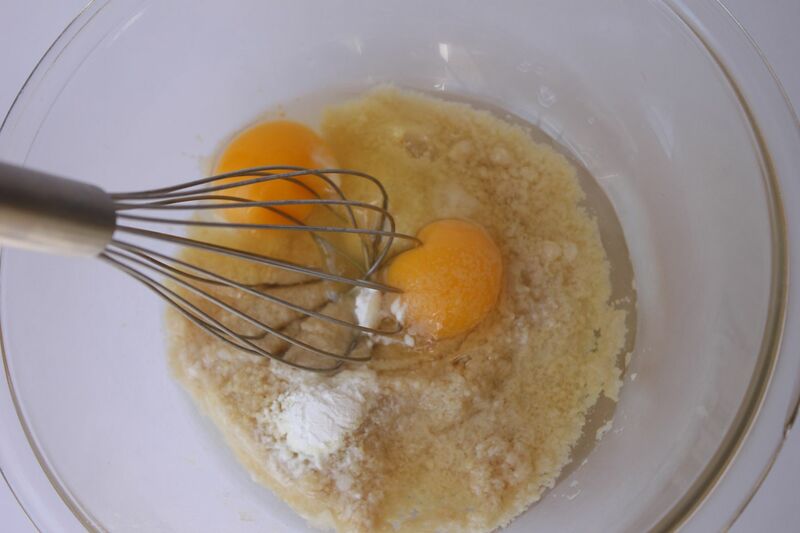 But search a little harder and find Almond Flour, much finer in texture and more traditional final pancake result. Thank you for the wonderful recipe. I made these for breakfast yesterday morning- but made them into mini pancakes. I also ended up adding milk instead of water (and increased the amount) and added some baking powder, as some readers suggested. They turned out scrumptious! I have never been a big pancake eater but I think I seriously prefer these over regular pancakes. I topped them with some sugar free maple syrup, sliced strawberries and whipped cream. Deliciousness! I made a waffle...topped it with fresh blueberries...Delish!